When time is spent in an office or indoors day in and day out, some can lose that connection to the outside world. And that loss of connection can lead to higher stress levels and more health ailments without even realizing it. But when that the gap between office life and outdoor life is bridged, quality of life - and health - improves. 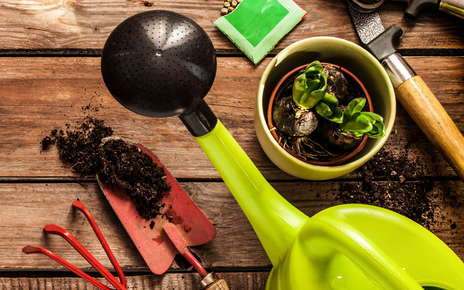 By adding in simple garden tasks or small DIY home improvement projects to your to-do list outside of work hours, you can go back to reclaiming that connection. It can also help ease stress, keep you active and limber (garden yoga anyone? ), and even improve your mood. Who could use a little mood booster? When one puts down their smartphones and picks up a spade and some gardening gloves, you not only give your mind a rest, but your body a rest too. Think of how your body reacts and responds when you’re scrolling through updates on your phone or computer? How is your posture? Are you tensed up? By setting the phone down and doing something more soothing - like most gardening tasks - you can effortlessly reduce the tension in your body and work on posture and body awareness. While gardening doesn’t seem like exercise, digging, planting, weeding, and other garden activities take some level of physical exertion. And, over time, stretching and strength can be improved through simple gardening tasks. What’s best about most small DIY home improvement tasks, like gardening, is that you can change your exertion level depending on the needs of your body -- it’s a hobby you won’t have to complete give up as your body ages. With any level of physical exertion, one should make sure that they are taking the necessary precautions to prevent injuries. The increase in physical exertion through gardening and small projects may not feel like a huge change all at once but being aware of how to avoid injury through resistance training and proper alignment can help in the long run. Proper chiropractic care, such as regular spinal adjustments, developing muscle balance, ensuring pelvic alignment, etc can help prepare one’s body for any level of physical exertion. That way the stress relieving properties of gardening and home improvement won’t be lost to injury. By educating yourself on the preventative measures one can take through chiropractic care, you can enjoy all of the health benefits of the outdoors!